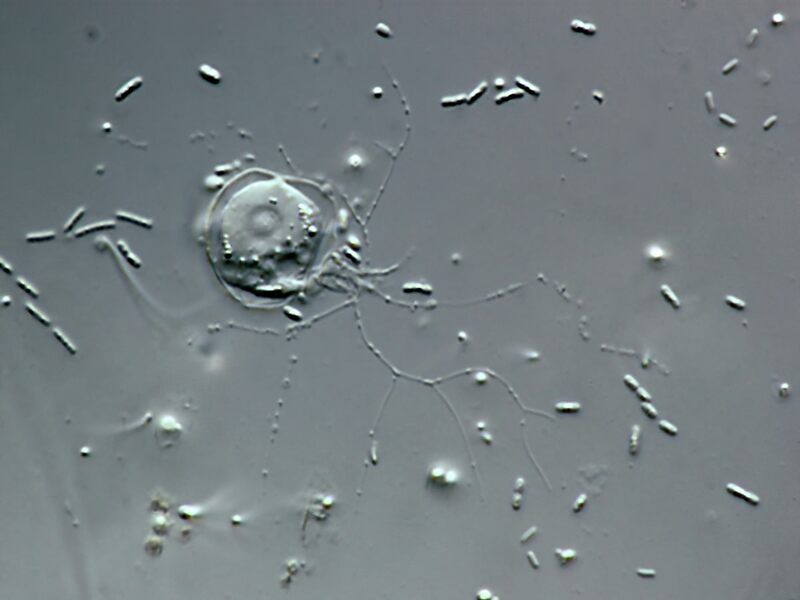 With very delicate reticulopodia bearing frequent regular extrusomes. 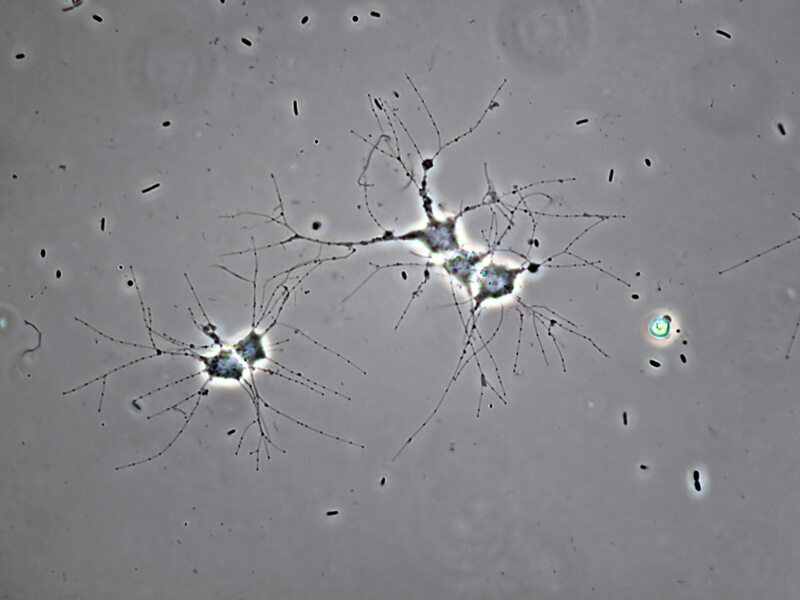 Sometimes biciliated or with biciliated swarmers. 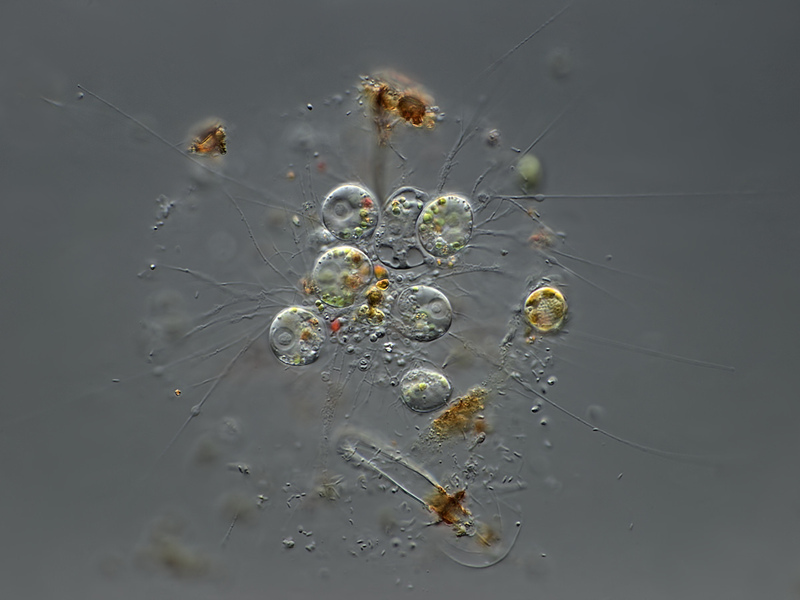 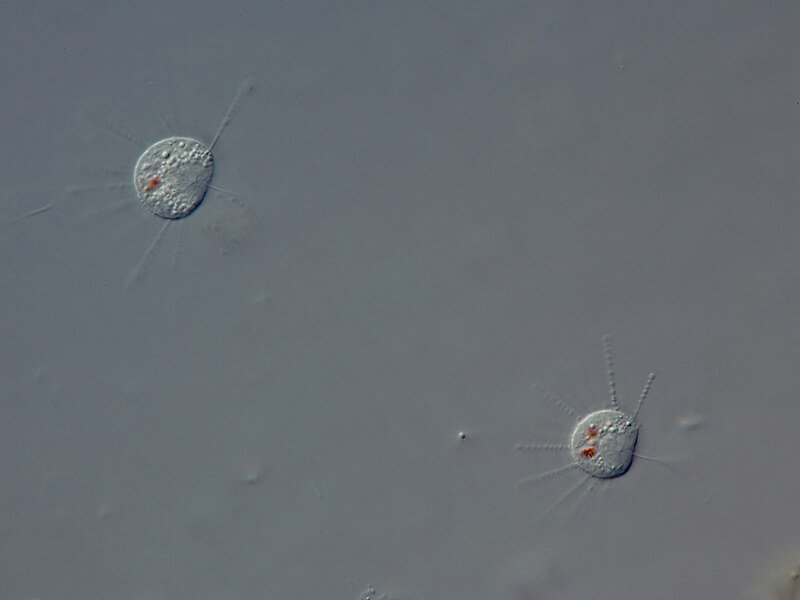 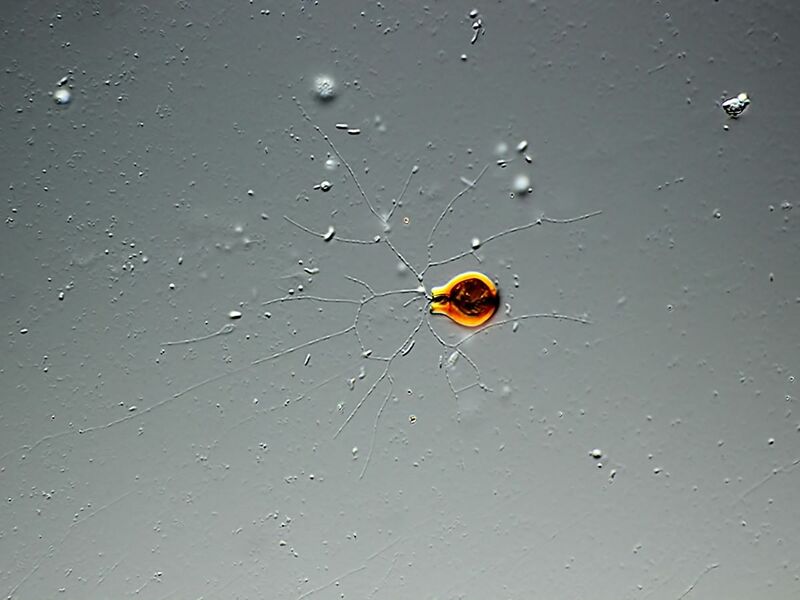 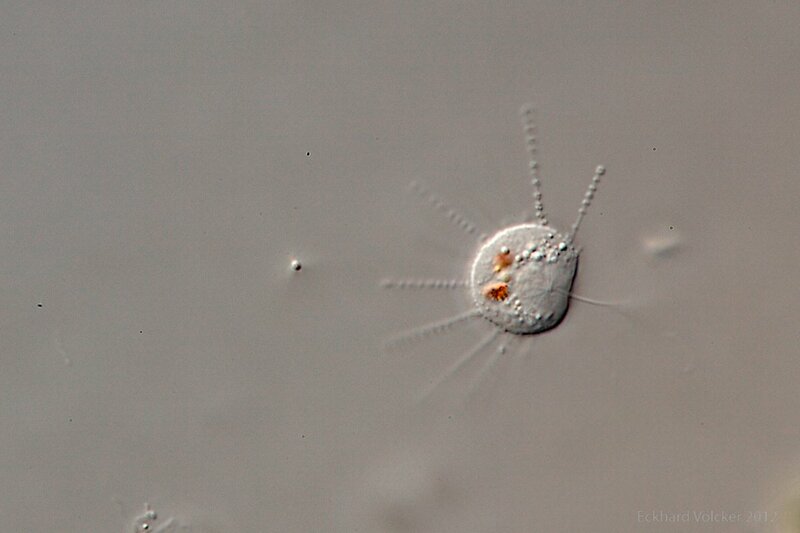 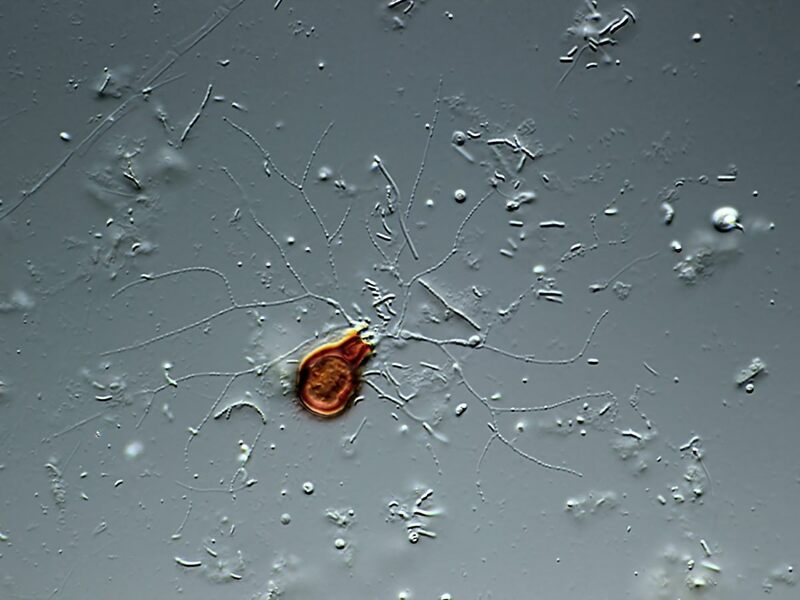 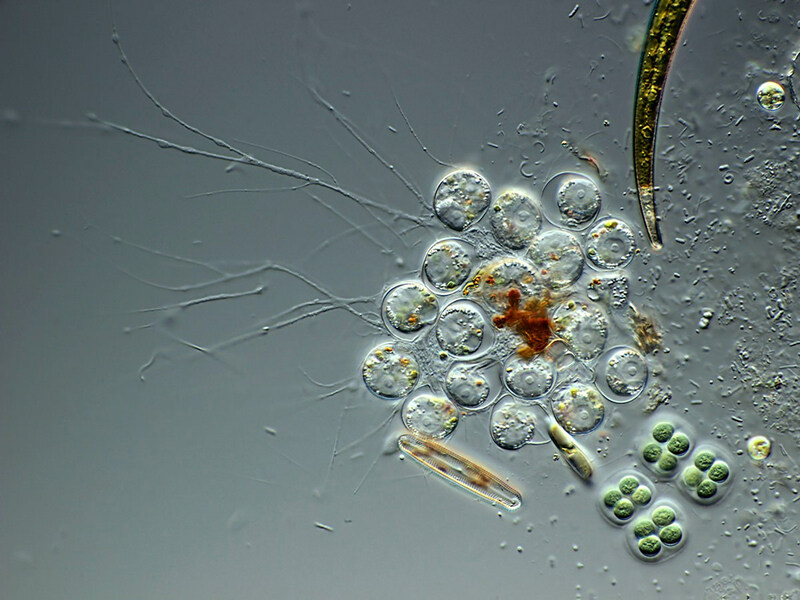 Heliozoans with an extracellular and usually stalked lorica. 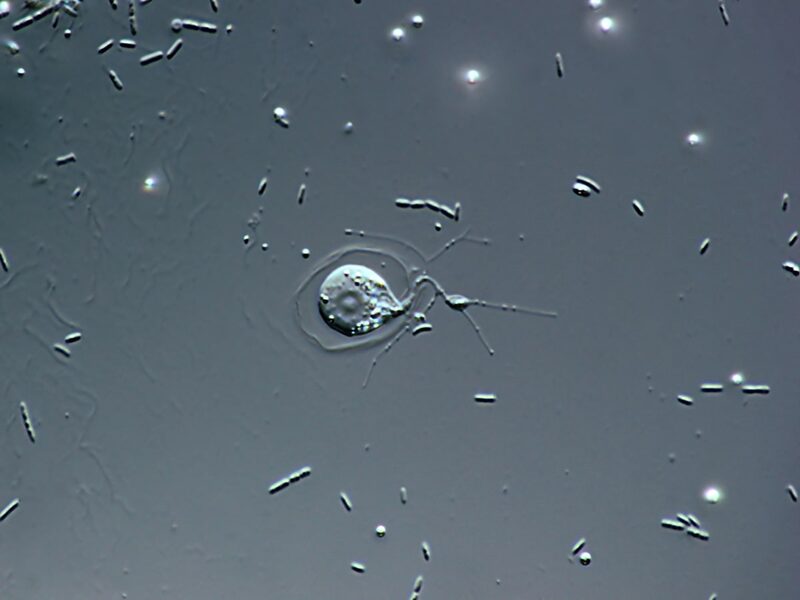 Extracellular capsule or lorica attached to substrate with axopodia emerging from perforations; kinetocyst extrusomes along axopodia; biciliated and amoeboid stages; can be colonial. 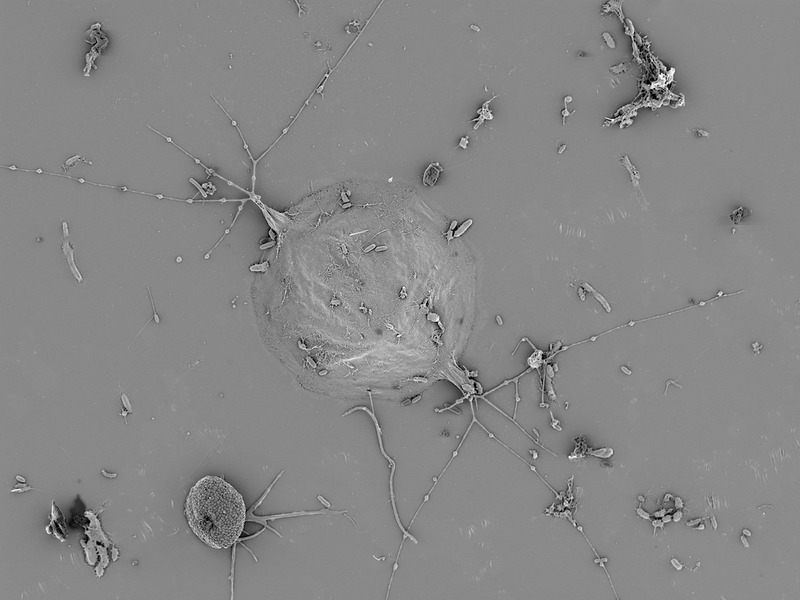 Biciliate freshwater hetero­trophic cells with axopodia. 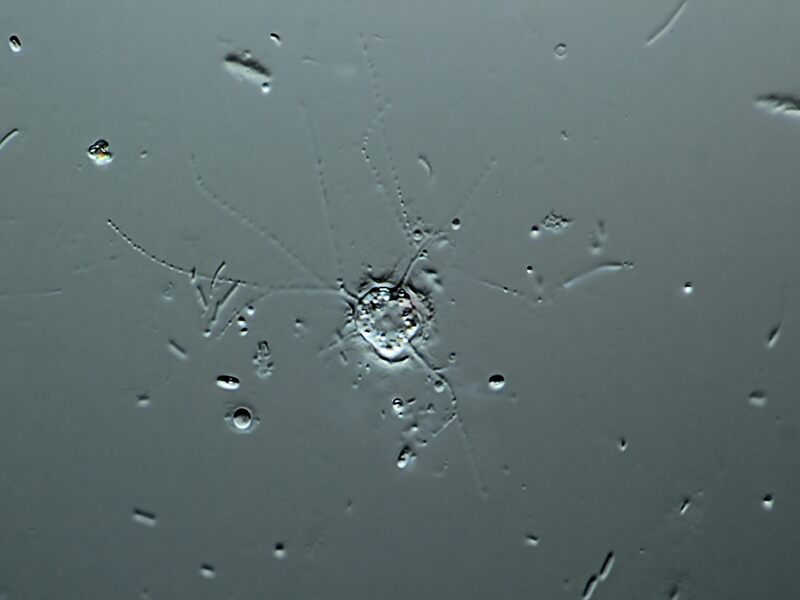 The centrosome, from which axopodial axonemes emanate, is located in a deep depression or pit on the anterior face of the nucleus. 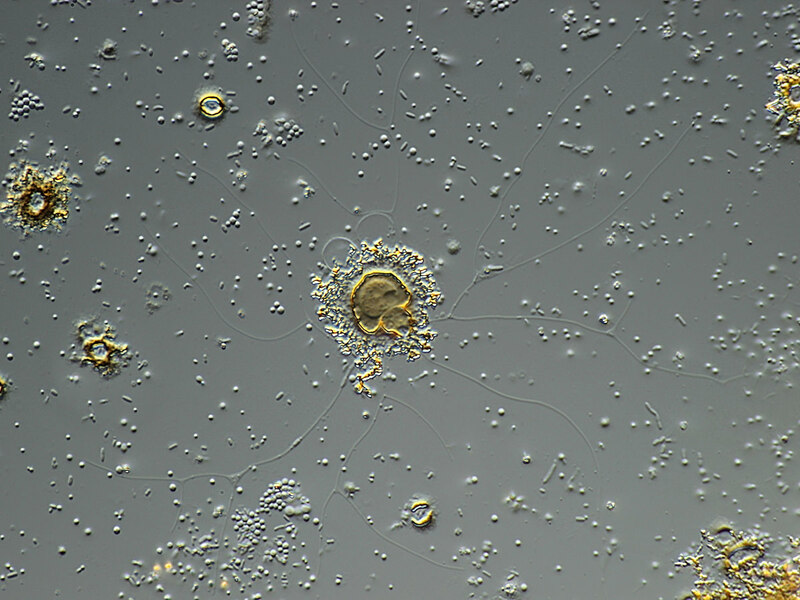 Testate amoebae with a hyaline organic shell that is usually on one side attached to a substratum. 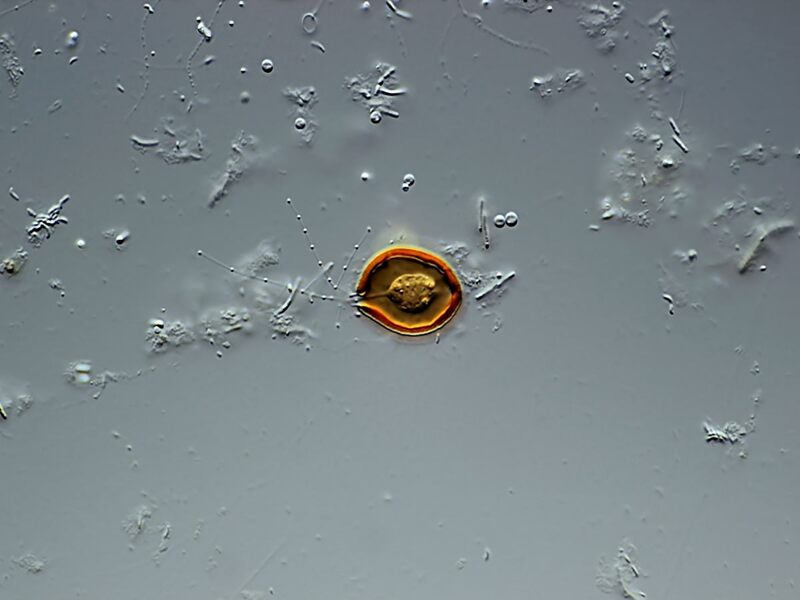 Shell hyaline and organic; spherical or pyriform; with neck that has a basal septum with lateral opening. 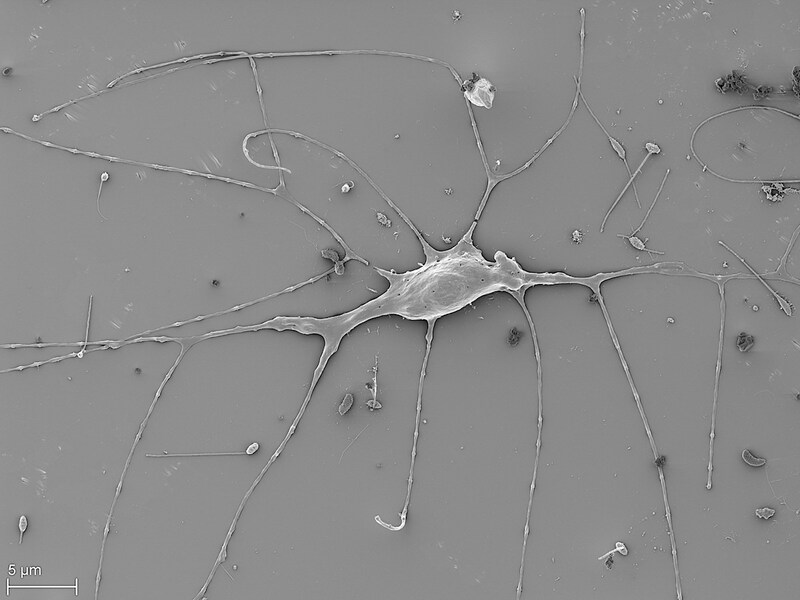 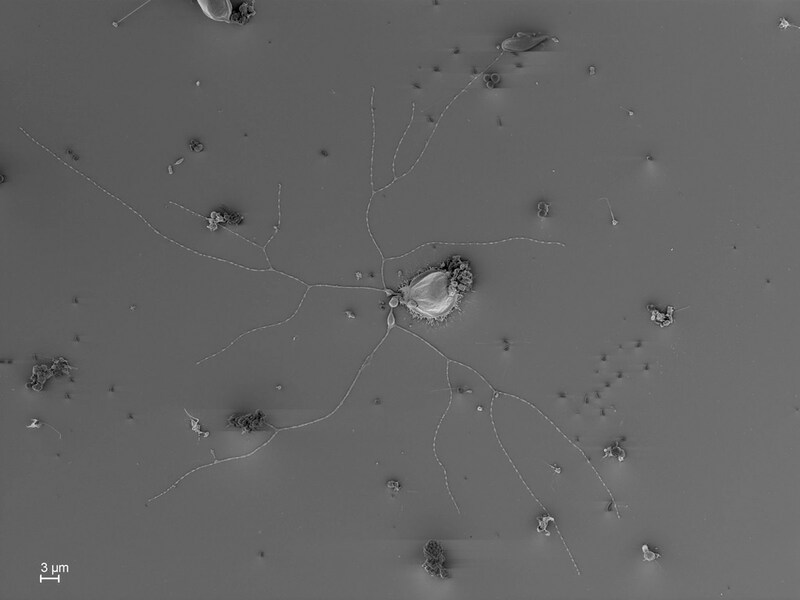 Filopodia with extrusomes that are able to brach and anastomose. 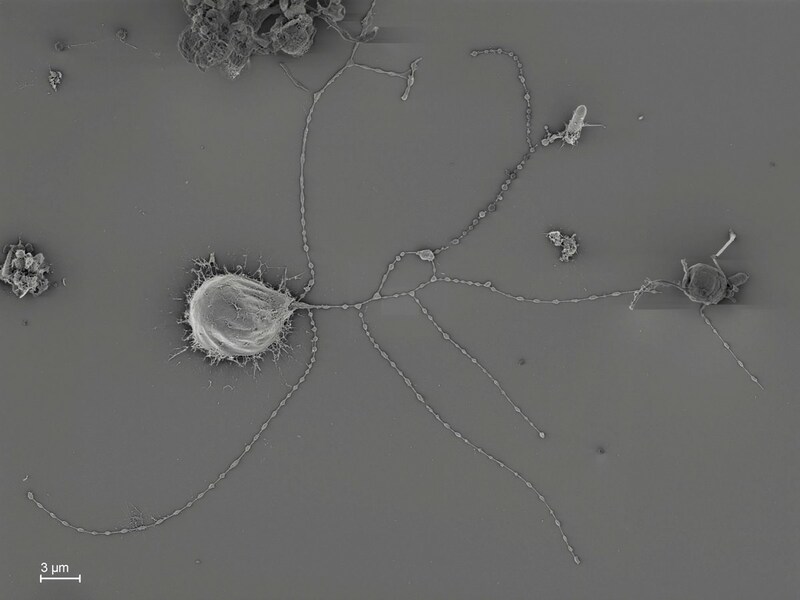 May produce biciliated swarmers. 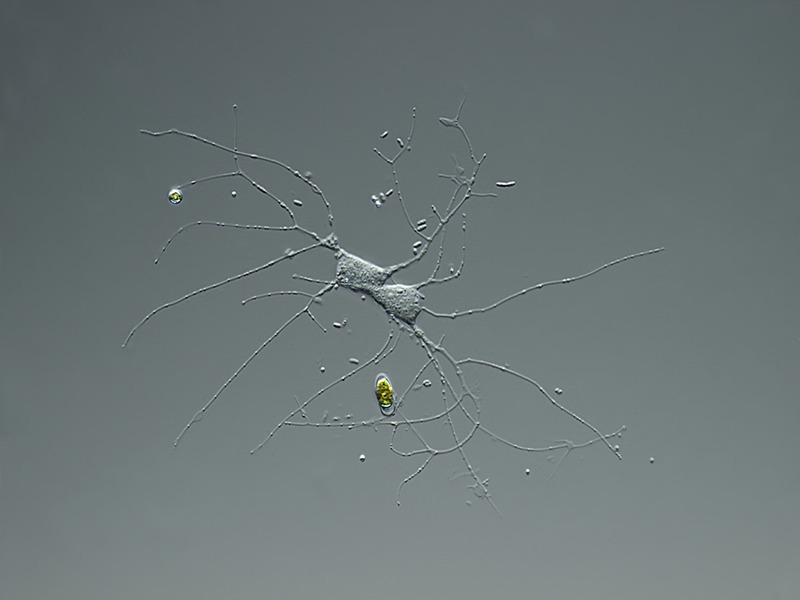 Sometimes in a colony with cells able to form a anastomosing reticulum. 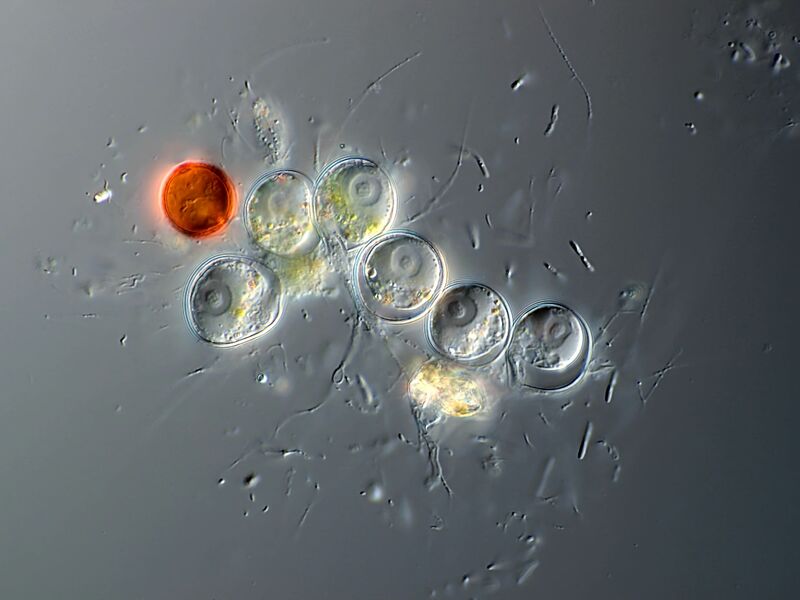 Shell hyaline, brownish and organic; flask-shaped; with or without neck; single terminal aperture. 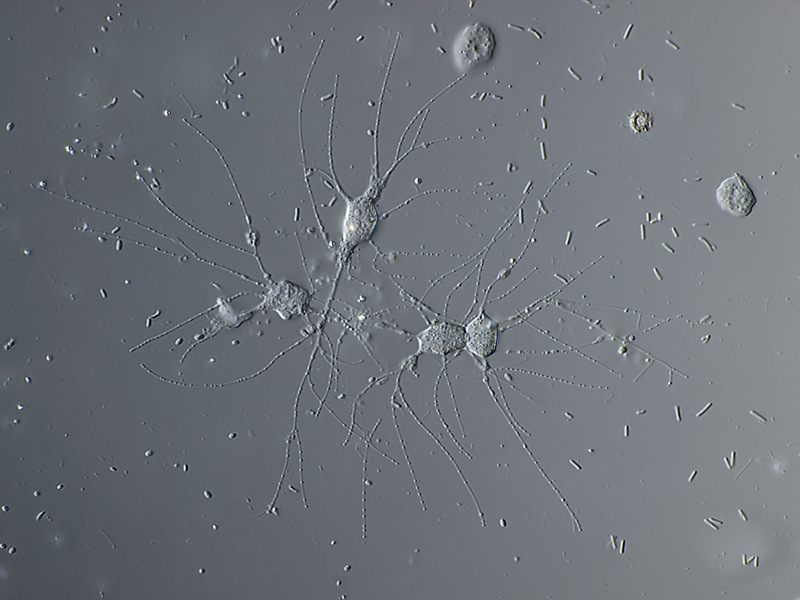 Fine branched pseudopodia with extrumsomes, sometimes anastomosing. 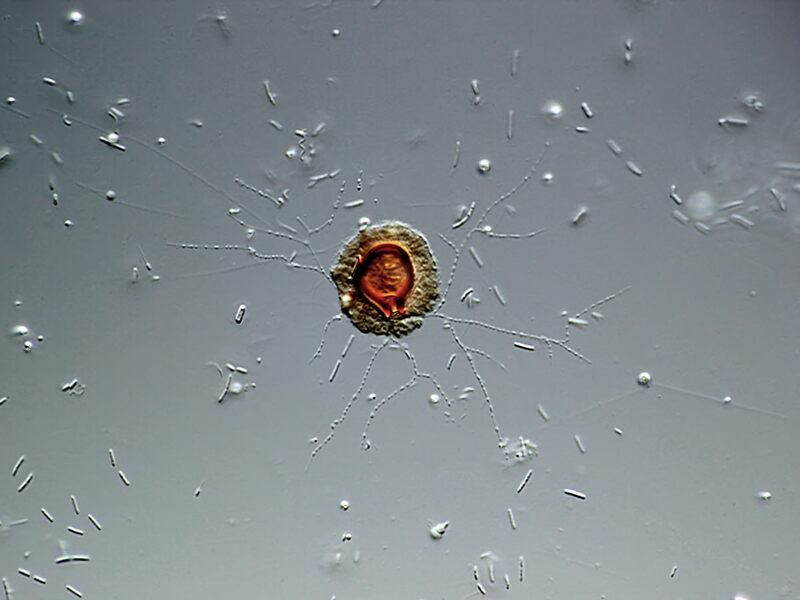 Body globular; shell flexible and hyaline with a small number of apertures; two short cilia. 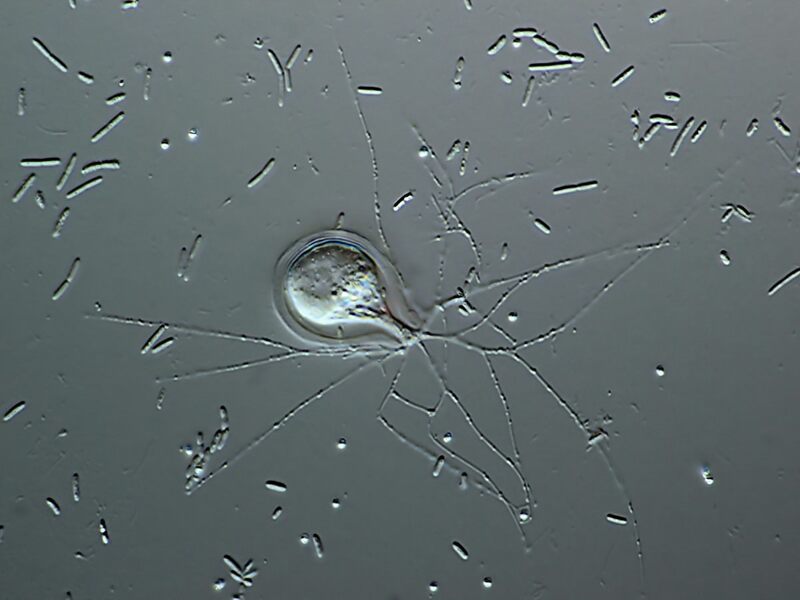 Shell hyaline and organic; flask-shaped. 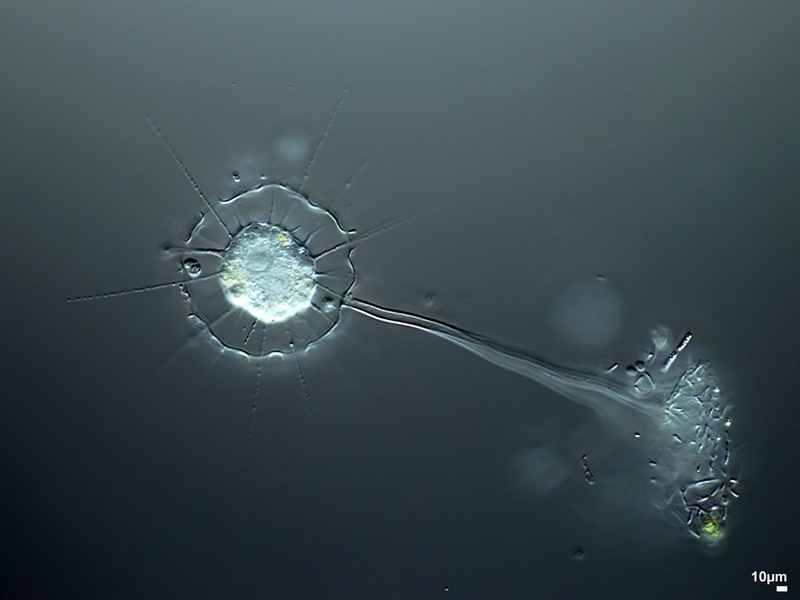 Shell hyaline and organic; separated in two compartments with a diaphragm; one side attached to the substratum; with a neck. 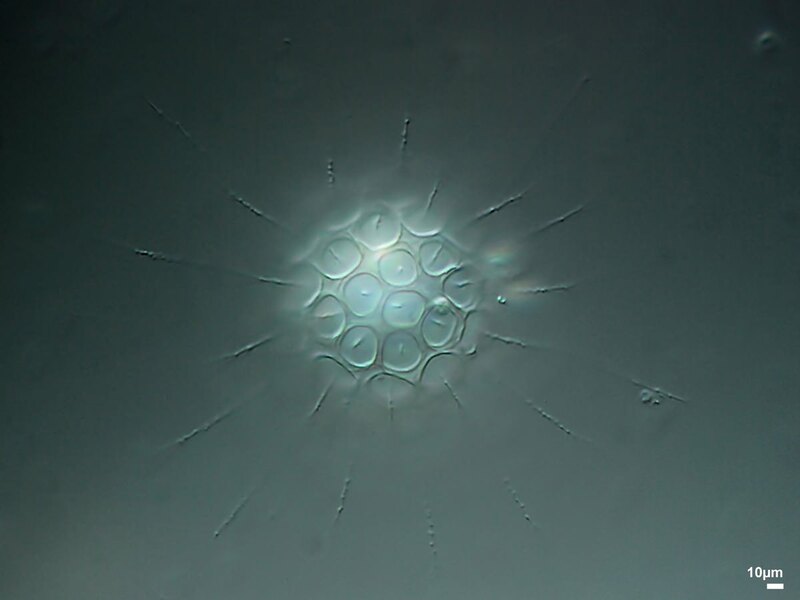 Shell hyaline and organic; one side attached to the substratum; two opposite apertures with a small neck. 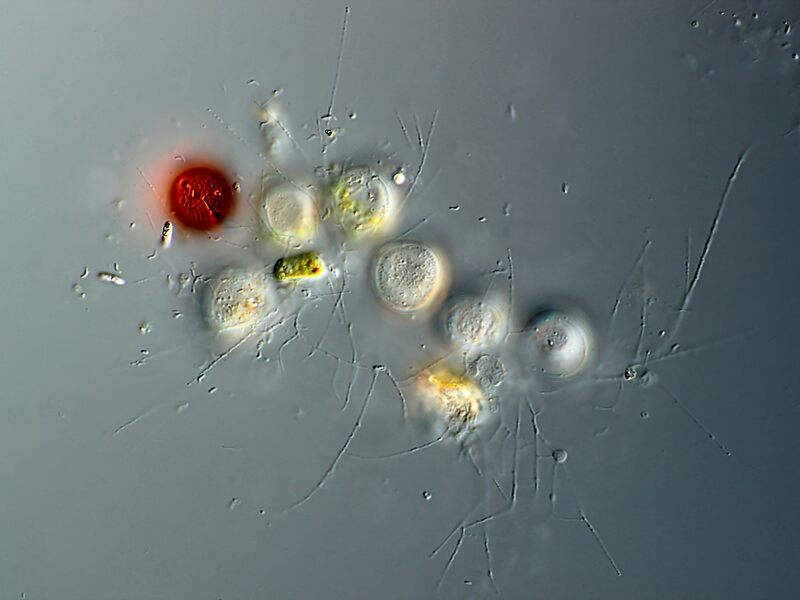 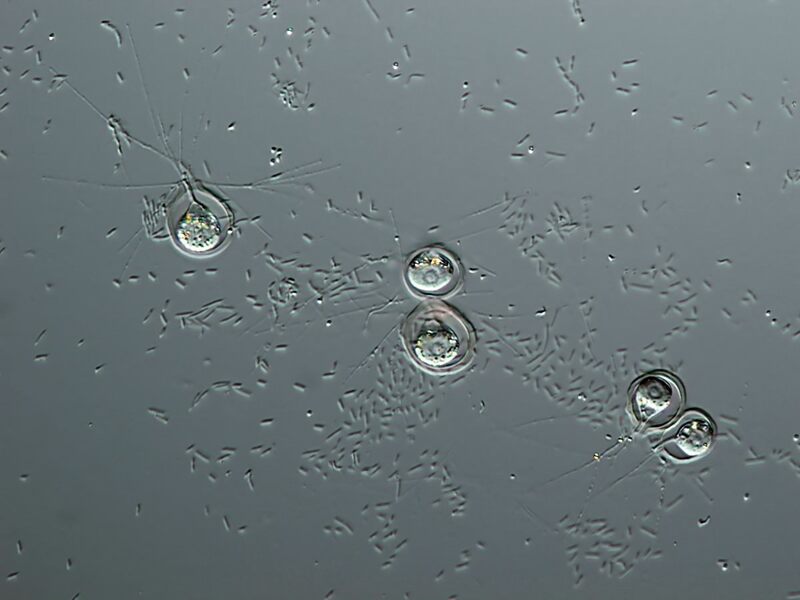 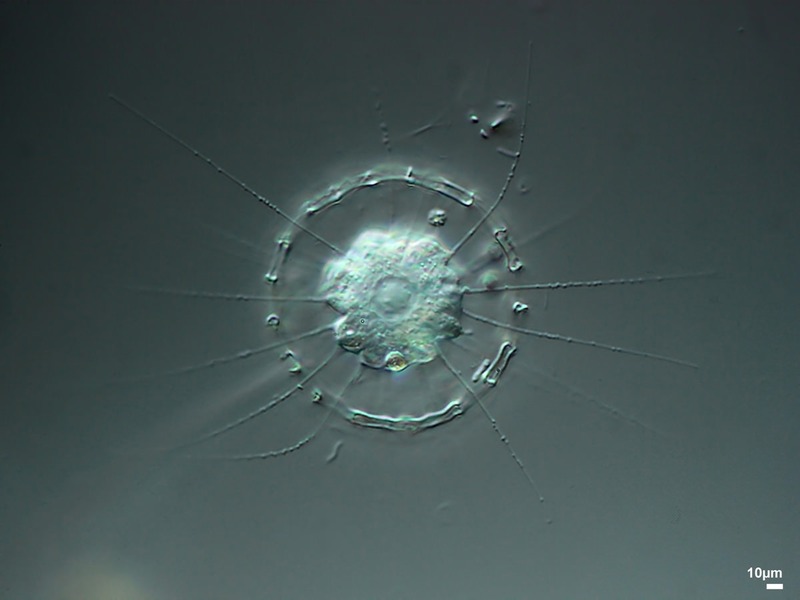 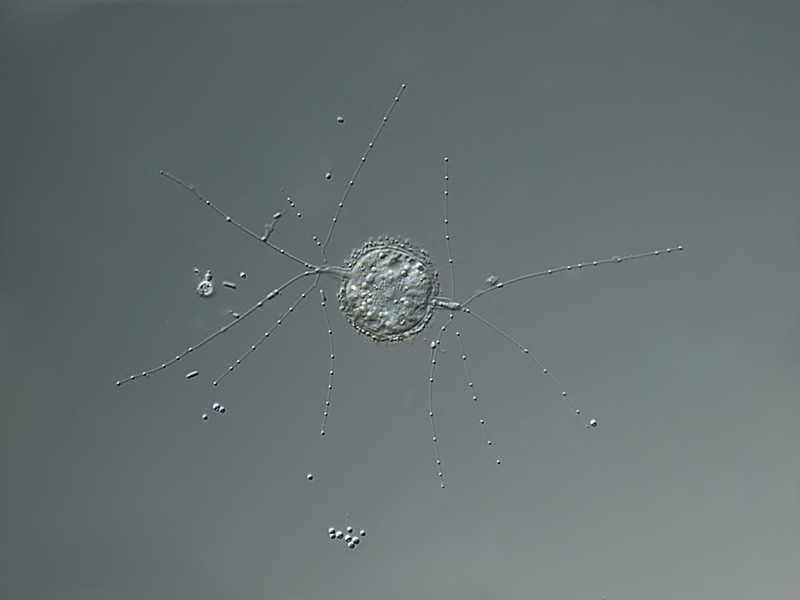 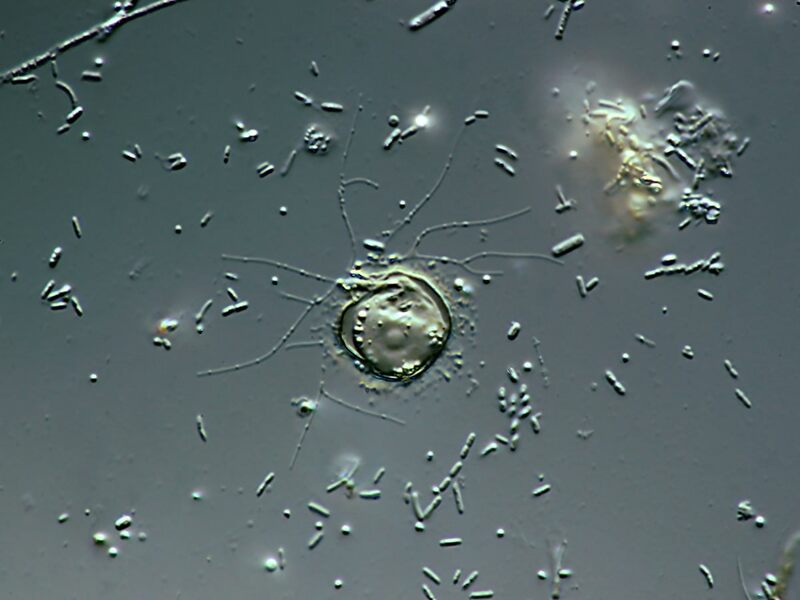 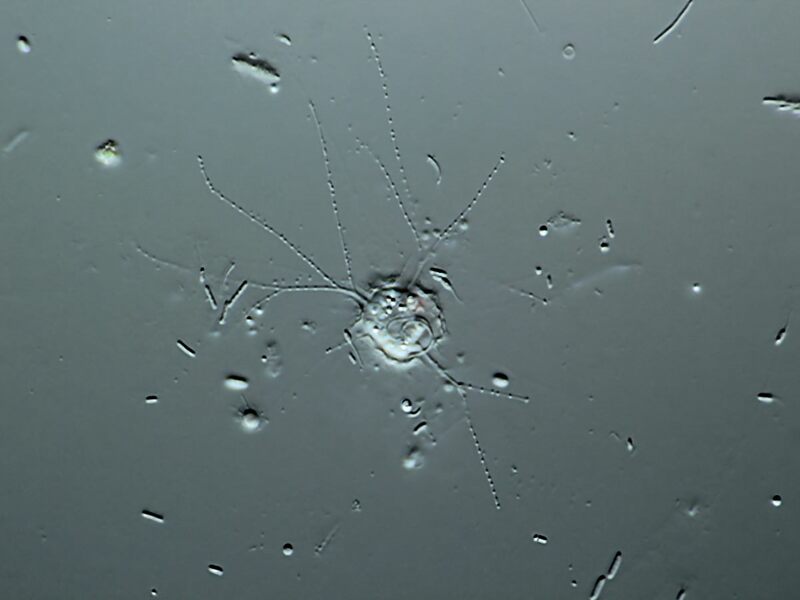 Small freshwater heterotrophic cells with extremely slender, branching granular filopodia, appressed to the substratum during feeding.